Can you than explain what is: the right frame of mind to know what is BS. For instance if I look at the temperature list, and I find the lhc 2nd in line just behind the Big Bang, and people tell me not to worry, while every bone in my body says that they are BS'ing, than do I just have to follow the leaders ... or should I perhaps wish for a stroke and become gay (Stroke turns rugby man gay) so I get to be bedazzled by Brian's beautiful comforting eyes ... cause they don't seem to have the same effect on me as they have on you. Ok, you can say that Cosmic Ray collisions have the same temperature, but their density & frequency levels are 10 billion times lower than in the lab. So Charm's can you please explain how I could get myself framed rightfully. So you mean any temperature not mentioned in that table doesn't exist? No, I just mean that it comes second last before the Big Bang. If you like to put other temperatures in between, as a reference, than you are welcome to do so. 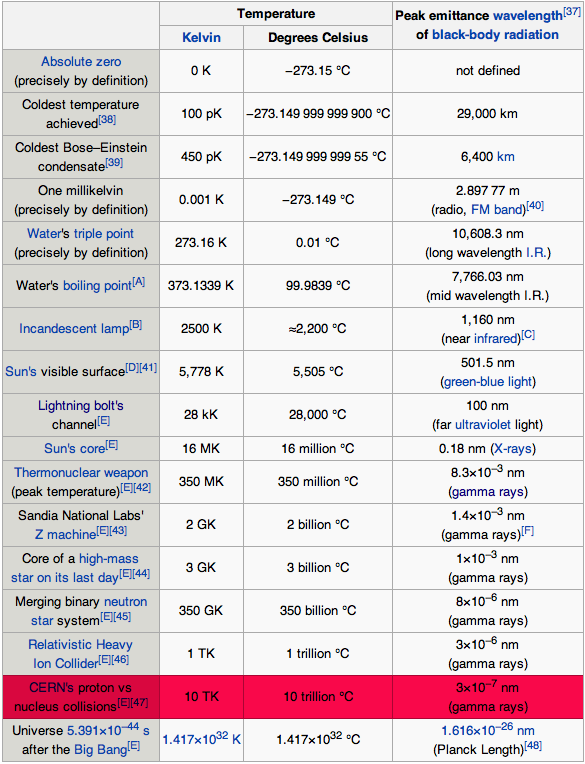 Kasuha wrote: So you mean any temperature not mentioned in that table doesn't exist? Okay, then you hopefully understand there can be many other events at temperatures in between any two items in the table. I guess my suggestion wasn't specific enough, I was alluding on temperatures of events between the lhc and the big bang. "Nature is doing it ... it hasn't caused anything weird. So why to expect it to happen to us!?" Those 3 concepts are rather Science-fictional and the first 2 should be caused by single hits, so I have nothing against their argumentation, they are correct, similar events do happen all the time. The third one starts to go up my alley but is still too weird for me. I rather look a more down to earth analogy: "lighting a candle". "In this state they can then readily react with oxygen in the air, which gives off enough heat in the subsequent exothermic reaction to vaporize yet more fuel, thus sustaining a consistent flame. The high temperature of the flame causes the vaporized fuel molecules to decompose, forming various incomplete combustion products and free radicals, and these products then react with each other and with the oxidizer involved in the reaction." Why a candle? Well the continuous high energy collisions, at a high frequency & density, and at one specific place in the nothingness that is filled with Dark matter (hot/cold), or Aether (gas/liquid) as it was called in the victorian era, could be compared to a sparkling match/lighter, whereby the continuos generated thermal energy moves through the air/vacuum/gas/liquid, to constantly heat up the matter/wax/atoms/protons/quarks in a distance, that will start to meltdown, and who may be then nearing the point of combustion (phase transition), increase the heat a little more and ... Pretty basic don't you think? To recap, all matter is build-up out of elementary particles that have vibrational patterns, and these particles interact with each other. Now when these particles find themselves in the vacuum, a bath full of dark matter and other structures that make up the fabric of (empty) space, now when this vacuum gets to be continuously shook-up with high energies, than it isn't unthinkable that at some point these organisms get to be disturbed in their dynamics, causing them to decompose (combust) and release a lot of energy. So a whole bunch of protons might start to splash open all at once, just like as if they where collided at high frequencies & densities, and this sudden eruption of energy would have the same effect in the nothingness, as the first collisions that started it off, and a chain of events might be set in motion. In nature there are about a thousand cosmic-ray collisions of a few GeV’s (1 GeV= 10^9 electron Volt) per second per m^2. In LHC it are about one 1 billion per second per cm^2. That’s 1.000.000 times more for a surface which is 10.000 smaller, a density difference of 10 billion. This year we humans are going to generate collisions on this planet, that are even 1000 times more intense, with energies of 8 TeV (1 TeV= 10^12 eV). These collisions are in nature even less frequent per m^2 while the frequency at the LHC of 1 billion per cm^2 is maintained. btw look at the table to make a comparison in temperature. The LHC is something like a magnifying glass where more and more collisions get to be packed into one condensed spot in time and space, while in nature it is more of a varying low density rainy flow. Actually what does distance in space means when you do the double-slit experiment and the photons get to feel the 2nd slit that is relatively a “galaxy apart” or “on the human scale” a few millimeters away? Now safety experts also like to wave with Ultra-high-energy cosmic rays of 10^20 eV, but these events are very rare, they happen only a few times a year, and over the whole surface of the earth. Note, we hardly have a clue of what these events are, who says that they aren’t small bursts. So overall what they safety raport likes to focus on are single events, never do they talk about the whole event and the "frequency & density", they don't think its an issue, I think it might be. I don't think he's concerned. I think he's enjoying it. i am not how very dare you!!! but Chelle, no offense, but you're sounding like a fearmonger, I'm sorry Kashua but I have to be honest!!! Of course I'm a fearmonger, if you would drink a whole bottle of vodka I will also tell you that you could kill yourself. The example with starting a fire by turning wood seems to be a good one to me, I wonder what humans and human life would look like today if fearfull persons had stopped the first ones who tryed to make fire this way. I agree, trying something unprecedented always is a risk, but learning nothing by trying nothing is also not a safe way to ensure our survival. We can never be sure if we do the right thing, but doing nothing doesn't automatically have to be the the right thing either. @chriwi, sure lots of trial and error, and lots of cudo's to those early heroes who played with fire, but we are now far beyond chemical and even nuclear reactions, and I believe that a reaction at a sub-atomic level isn't containable. There is a line between bravery and stupidity if you look at the table of temperatures it is clear that we are no longer playing with just a little bit of fire. Anyway what are you really hoping to find; the Higgs, or some source of energy to travel to an other galaxy, well here again; how do you contain such an energy source? btw it takes months to discover something (a bump) in the generated results that are stored on hard-drives, when you play with fire or chemistry and nuclear reactions, you can immediately bring up a fire extinguisher to put a stop on what is running out of control, or slow down the nuclear process and/or cool it with water; early detection, early response ... In the case of the Lhc you have done an other few billion collisions before someone would notice if there is something out of the ordinary happening, and decides that the beam should be dumped. Note, a few collisions at a time should be okay, but not at these ultra high frequencies, that are way beyond those of the cosmic ray above our heads. Chelle wrote: Of course I'm a fearmonger, if you would drink a whole bottle of vodka I will also tell you that you could kill yourself.